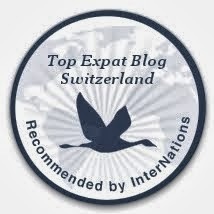 This website is run by Michela and chronicles the life of her family as expats in Geneva. It is a fantastic source of information for events and life in general in Geneva and the surrounding region, with excellent tips on fun things to do with your family either at home or in the Suisse Romande region. When Michela contacted me and asked me saying she had come across my blog through the www.expat-blog.com website and wondered if I would agree to an interview with her as part of their "Expat Dads Who Blog" feature, I jumped at the opportunity. She had already published an interview with another expat dad living in Vevey, and I liked the idea of sharing my experiences since moving here with a wider audience (that is the goal of my blog, after all). The first part of my interview explains why I moved over here, what the move was like and how I felt before/after moving here. Feel free to get in touch any time, drop me an email to erniemcpeck@gmail.com.